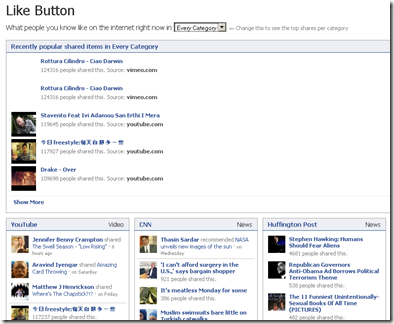 ← How to Add Facebook Like Button to your Blog? So, if you run a website you know how to add a Facebook Like button on your webpage for your readers to share it with their friends. If you are not a publisher but active on Facebook, I have a very cool website to share with you. LikeButton.me is a new web service that shows a single page view of all the websites liked by your friends. In a single page! If you have been to AllTop.com that aggregates news from around the web, Likebutton.me provides a similar view and categorizes links liked by your Facebook friends. The interface has a number of columns from popular websites in every category and it shows what your fiends have shared at the top of the box followed by what’s popular in that website. 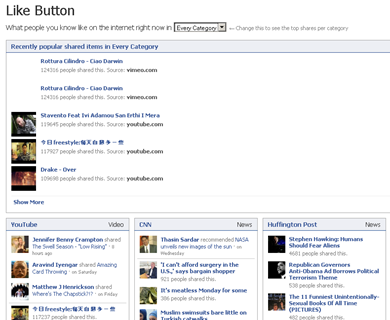 Plus, it also shows top links in different categories so you can get an excellent view of what’s happening in Facebook world quickly. Plus, it’s way easier than going through your news feed. I can see myself checking this page out once a day to get a quick glimpse of what my friends are reading aside from checking my Google Reader for news. This is a very cool way to check out websites with a social element – kind of like Digg but powered by the huge user base in Facebook. Also, if you like article don’t forget to give it a thumbs up with the new Facebook like button in the website under each article.